On the fourth of 12 Days of Muppet Christmas, I question whether a puppet floating in a tank of fluid or an Oscar winner in a blond wig makes a better guide through Scrooge’s memories. 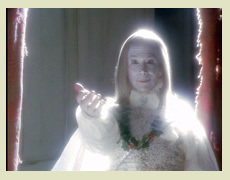 The Ghost of Christmas Past from Muppet Christmas Carol is probably the depiction that comes closest to how Dickens described the character in the original novella. Though not explicitly stated, Dickens’ description is meant to evoke the idea of a candle flame come to life, and one can sort of tell how the team behind MCC took that as a jumping-off point in constructing a rod puppet meant to float in oil or water to give an ethereal effect (almost literally). One of the few departures Muppet Christmas Carol made from the source material is that it added another Marley ghost to the mix. But do two Marleys make for a better adaptation than the 1999 TV version starring Patrick Stewart? Find out on this, the third day of the 12 Days of Muppet Christmas. 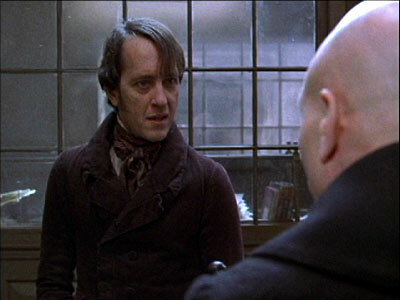 On this, the second day of my 12-day quest to discover how The Muppet Christmas Carol measures up to my favorite non-Muppet version, the 1999 TV movie starring Patrick Stewart, I take a look at Scrooge’s employee and foil, Bob Cratchit. Joyeux Noel, friends and readers, and thank you for joining me for the 2018-2019 installment of 12 Days of Muppet Christmas! Because I’m a Muppet heretic, I can admit without hesitation or shame that Muppet Christmas Carol is not my favorite adaptation of the story. For nearly 20 years now, my favorite adaptation has been the 1999 made-for-TV movie starring Patrick Stewart and airing originally on TNT. However, given my relatively new appreciation of Muppet Christmas Carol, I want to see how the two versions measure up to one another. So for the next 12 days, coinciding with the traditional twelve days of Christmas, I’ll be comparing and contrasting the individual elements of these two different adaptations of the classic story and assigning an advantage to one or the other each day, because what’s the fun of comparing and contrasting without arbitrary value judgments? Then I’ll share the final results on January 6th (Epiphany). Michael Caine and Patrick Stewart are both actors renowned for their vast talent. Though playing the same character, each has his own unique interpretation. It’s not a question of right or wrong, good or bad. Though different from one another, each actor’s take on the character is completely valid, which makes it interesting to see how each approaches the same character from an entirely different angle. Why do you delight in torturing us?…JUST GO ALREADY!!! I first saw Muppet Christmas Carol in December 1993 when we got the VHS as a Christmas present. Suffice it to say, the initial impression it left on me was not favorable. In fact, it was so unfavorable that it was approximately 20 years before I could watch it again. This is the story of Little Shop of Horrors and how I went from being a traumatized child to an enthusiastic fan to an eager participant in a stage production thereof. It is also the story of how my younger brother and I each ended up participating in separate, but related, productions of it. I liked the whole “Man or Muppet” bit, I very much enjoyed Matt’s money note, and I’m just thankful Kermit’s little microphone didn’t smack anybody in the eye (as far as we know) when it went flying at the end. I could do more in-depth analysis about it, but honestly, at this point I’m basically just saying…it is what it is. I can accept this iteration as Kermit, but he’s not “my” Kermit. I can enjoy what he’s doing, but I can’t emotionally invest in him. And that could very well change. I have keep reminding myself that it took me six years to fully embrace Steve’s Kermit, and Matt has only been doing it for just over a year. I’m just grateful that they didn’t sing “Rainbow Connection.” Kermit did sing “Rainbow Connection” on The Talk with his panto co-star Marissa Jaret Winokur. There was no warning, so I didn’t have time to prepare mentally, but I curbed my kneejerk reaction to leap from the couch and turn off the TV, so that’s something, I guess. And it was fine. It was a perfectly lovely performance, and it brought back fond memories of seeing Winokur perform in Hairspray when I was in college. So I’m pretty okay with the whole situation. It’s not bad, it’s not good…but it is what it is. At the beginning of this segment Minka Kelly (whoever she is) is talking about her background working as a scrub nurse. Turn on the closed captioning during that part; it’s hilarious. “Craniotomy” becomes “crane yot me” and “hysterectomy” becomes (and this is epic) “‘histoires d’hiver’ recht me,” or…removal of French winter stories, I guess? It reminds me of the time I spent editing speech recognition documents as a medical transcriptionist.